Examples on the various software is available on request. Incident Management System - The software contains reporting which will group and count the Incidents which has been raised as per the Incident Management Protocol (IMP) in Alert Level as well as per Root Cuase. The Incident Management Protocol Software will assist you in summarizing the Incidents per Critical Control Point (CCP), Alert Level, Trigger and Root Cause. This will assist in understanding which Incidents re-occur and assist in decreasing the number of Incidents. 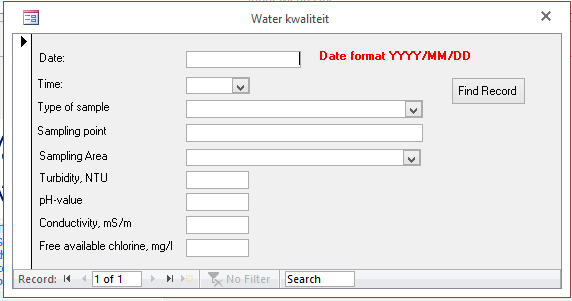 Water Quality - The report lists all your water quality tests and mark the samples that were non compliant, and provide the user with a report indicating the % compliance. Within seconds, the user can provide compliance for any period of time. 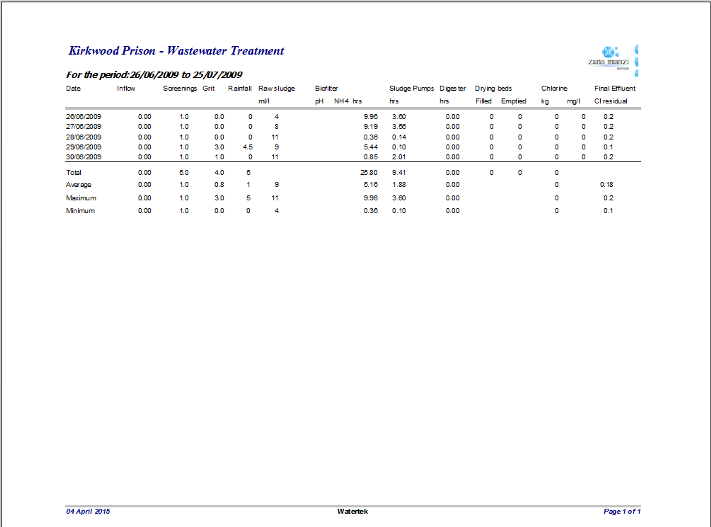 Wastewater Quality - The report lists all your quality tests and mark the samples that were non compliant, and provide the user with a report indicating the % compliance. Within seconds, the user can provide compliance for any period of time. 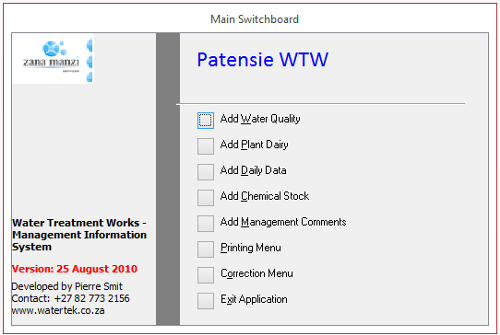 Water Treatment - The system has inputs for the following: chemical stock, flow meters, media levels, water quality (all process units and sampling points within the distribution network), incident register, management comments, etc. The user can then get the following reports from the system: management report for any period, which will reflect abstracted volume, production, water loss, chemicals stock usage and dosing rates, etc. The same info is presented in a graph. The user can also within seconds get a report on process unit performance and media level trends. 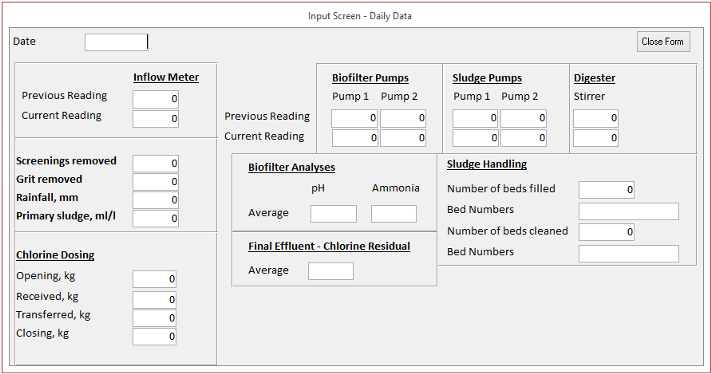 Wastewater Treatment - The system has input for all the meter readings, process control tests and lab analysis. The user is then able to get a management report from the system, indicating inflow, quality, kl/kWh and many more. The same info can be displayed on a graph and the facility is assisting WSA's in providing info for Green Drop. Job Card System - The system has inputs for staff, km's travelled, time and stock. The system is able to provide the user with a quote system, a job card system and a costing system. All the above software is developed making use of a Microsoft Access database and could be run on your local machine. There is no need for having the software on your machine, as the software comes in a runtime version. Copyright Pierre Smit �� 2019. All Rights Reserved.